Ringo Starr schedules show in Atlantic City this summer . Beatles Radio: The Beatles, Solos, Covers, Birthdays, News The Fab 4 and More! 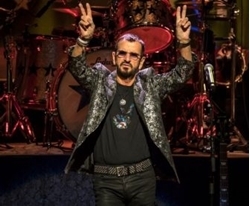 Ringo Starr will bring the latest edition of his All Starr Band to the Event Center at Borgata Hotel Casino and Spa in Atlantic City, June 2. Tickets, priced from $89 to $129, go on sale Jan. 12 at 10 a.m.; visit theborgata.com. The group’s lineup will include Steve Lukather (of Toto) and Colin Hay (of Men at work) on guitars and vocals; Gregg Rolie (of Santana and Journey) on keyboards and vocals; Graham Gouldman (of 10cc) on bass and vocals; Gregg Bissonette on drums; and Warren Ham on sax, harmonica and other instruments. Starr, 77, released his 19th studio album, Give More Love, in September, and was honored with knighthood at the end of 2017, “for services to music.” Click here for a review, with setlist, videos and a photo gallery, from his Nov. 16 concert at NJPAC in Newark. Starr has not released the full itinerary of his 2018 United States tour, so it is possible that more New Jersey shows will be added.